The story of these Chocolate Chip Peanut Butter Protein Cookies begins the way so many unplanned yet critically important purchases do: in the aisle at Target. I was shopping for protein bars (and nothing else that had mysteriously made its way into my cart) when I passed a huge display of shiny wrapped peanut butter protein cookies. Made with whey protein and covered in promises to be low carb, high fiber, and delicious, these protein cookies sounded too good to be true. Upon closer inspection, I discovered that not only did most of these protein cookies contain nearly as many calories as a full meal (well beyond my needs for a cookie), they cost almost $3 each and the ingredient list left quite a bit to be desired. I couldn’t pronounce half of them. Rather than spend a small fortune, I decided to see if I could come up with my own recipe for Peanut Butter Protein Cookies that delivered the same qualities promised on the wrapper—high protein, peanut butter packed, soft, chewy, delicious—but wouldn’t blow my grocery budget or eat up my daily calorie count if I decided to have more than one. Say hello to my healthy homemade Peanut Butter Protein Cookies! They are just 112 calories each and contain 7 grams of protein. Eat two and you are up to 14 ??. These are also EASY protein cookies. One bowl, a spoon, and a little oomph is all you’ll need. These cookies are soft, chewy, and taste reminiscent of an old-fashioned peanut butter cookie. (These Peanut Butter Protein Bars do too!) They’re sweet enough for dessert but wholesome enough to qualify as an acceptable post-workout snack. I couldn’t choose which occasion I preferred them for more, so I opted for both. In addition to the peanut butter and eggs, the majority of the protein in these cookies comes from the use of whey protein. I use this brand of vanilla whey protein powder. If you are in the market for a chocolate protein cookies recipe, I think these cookies would be delicious made with chocolate protein powder too. I haven’t tried a plant-based protein powder yet, but a few readers have reported that pea protein powders have yielded delicious results. If you decide to play around with the recipe and test it out, I’d love to hear how it goes! If you’ve never purchased whey protein powder and aren’t looking to (though I’d hope that any of these recipes with protein powder would convince you), you can check out my original Protein Cookies, which are made with peanut butter, quinoa, and banana. 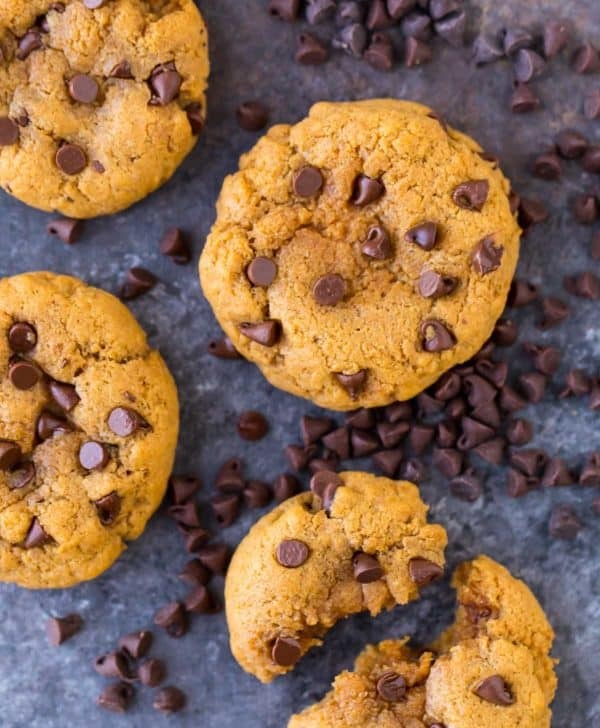 They are more reminiscent of a healthy muffin-like cookie than an ooey-gooey peanut butter cookie but are still a yummy, relatively high-protein option. 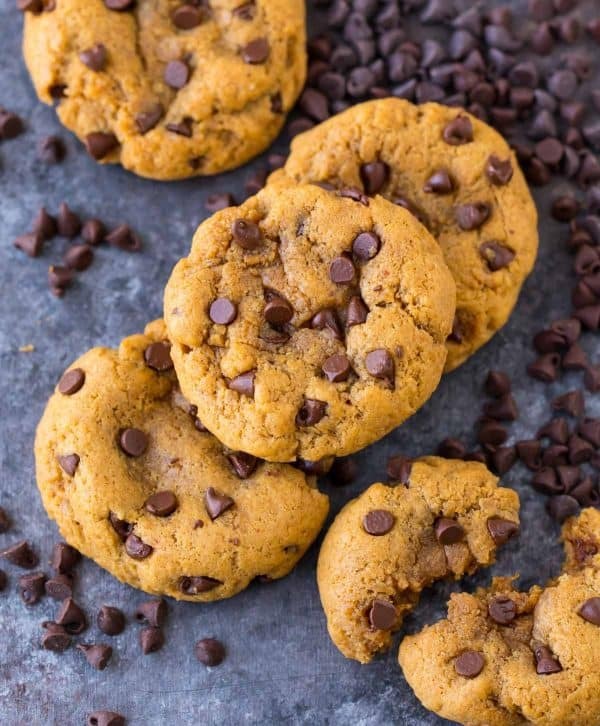 Soft and chewy homemade Peanut Butter Protein Cookies. Low carb, 112 calories, and 7 grams of protein each! Flourless, gluten free recipe made with vanilla whey protein. Stop wasting money on store bought protein cookies and make this easy recipe instead! Place a rack in the center of your oven and preheat the oven 350 degrees F. Line a baking sheet with parchment paper. In a medium bowl, combine the peanut butter, coconut sugar, salt, egg, egg white, and vanilla extract. Mix briskly until ingredients are well blended. Sprinkle the baking soda over the top. With a rubber spatula, work in the protein powder and coconut flour until well combined. The will seem very dry first but will continue to come together as you stir and push. Fold in chocolate chips. At this point, judge your dough, as the amount of moisture may vary based on the brand of protein powder and nut butter you use. It should be slightly sticky but not a total mushy mess. If you need a firmer dough, add a bit more protein powder. For a looser dough, sprinkle the batter with a bit of milk (or almond milk) and with a spatula, fold it in until the dough comes together. With a small cookie scoop or spoon, portion the cookie dough by tablespoonfuls and drop onto your prepared baking sheet (you will have 12 to 14 cookies total). With your fingers, gently flatten the tops of the cookies, as they will not spread but will puff up during baking. Bake for 5 to 6 minutes, until the edges are barely golden brown and dry to the touch but the middles seem fairly doughy. Do not overbake! Place the cookie sheet on a wire rack and allow the cookies to cool on the baking sheet for 3 minutes before transferring them directly to the wire rack to finish cooling. The consistency of the dough may vary based on the brand of protein powder and nut butter you use. It should be slightly sticky but not a total mushy mess. If you need a firmer dough, add a bit more protein powder. For a looser dough, sprinkle the batter with a bit of milk (or almond milk). No other flour can be substituted for the coconut flour. Coconut flour is incredibly unique and thus needs to be used in this recipe. I haven’t tried this recipe with vegan or plant-based protein powders yet, but I have heard from readers that have had success with pea protein. If you decide to try them this way, I would love to hear how it goes! Store cookies in an airtight container at room temperature for up to 3 days. You can also freeze them for up to 3 months, then thaw a few at a time. I don't recommend microwaving the cookies, as this tends to dry them out. Thanks Shawnna! You have a great weekend too! DO IT Brittany :) I hope you love them! HOORAY, I’m so glad you enjoyed them, Demi! Thanks so much for giving them a try and reporting back! I’m eager to try this recipe but I don’t use protein powder what would you change in this recipe if you were to omit the protein powder? Hi Amanda, unfortunately, protein powder is a key ingredient in these cookies and cannot be substituted. I’d recommend checking out this recipe for protein cookies instead! don’t know what vanilla whey protein powder is???? Is there a substitute??? Hi Jean, no, there is no substitute for the protein powder. If you’re interested in a protein cookie recipe without the protein powder, you could check this one out! I made these this afternoon with a plant-based protein (Vega Sport) and no other modifications (aside from chunky, slightly drippy all-natural peanut butter). The texture turned out great! Thank you for providing me with a yummier way to use my protein powder and a healthier way to satisfy my sweet tooth! Thank YOU for giving the cookies a try and reporting back, Emily! I’m so glad to hear you enjoyed them! I love healthy version of a delicious treat! Chocolate chips and peanut butter? Yes please! I have never workd with coconut flour or sugar before, so I was nervous to try these. However, they turned out to be chewy and YUMMY. I will definitely make these again. Thank you SO much! HOORAY Shelby! Thank you so much for taking the time to review the recipe. I’m so glad you enjoyed the cookies! Made these with my toddler today for a healthy protein-packed snack. We both loved them! Thank you so much for this recipe. I subbed vanilla pea-based protein powder and they turned out! Elizabeth, I am so happy to hear that you and the little one both loved these! That’s a great tip on the pea protein powder too. I’ll note that in the recipe! I’ve made these several times now (I just love them!). Today I made a version with chocolate whey protein and it was mmmmmmm good. More chocolate is always better, right?! ALWAYS Elizabeth, thank you for trying the recipe and reporting back!! Pam, I believe I made these with Jif Creamy Natural! It’s my go-to for baking. It’s shelf stable, so it behaves well in baked recipes. For my toast and snacking, I like using the truly natural drippy PB that you usually store in the refrigerator. I hope you loe these! Just made these today and they are just super! Love the taste!! Followed your recipe using light brown sugar and Jif Natural creamy PB. Husband loved them! Will definitely make them again!! Thank you!! Laurie, that’s so great news, thank you!! I used the VEGA protein and these are great!! So happy you loved these Terri! Thank you for taking time to leave this fantastic review. Diane, I am so happy you both enjoyed these! Thanks so much for the tip about the regular flour too! Marisse, my guess is that they are overbaked. I’d try pulling them out a few minutes earlier next time. Also, note that the recipe was developed with whey protein powder, so if you used a different brand, that might have affected it too. I did it! I conquered my fear of baking w/ coconut flour!! And the cookies are super yummy (or according to my 4 yr old, “very delicious”)! I think my cookie scoop is xsmall because I ended up with 27 cookies. But that just means I can eat 2x as many for the same calorie count, right?! Also, I used plant based protein and had to add a splash of milk to the batter because it was too dry for my liking. But they turned out great! Thanks for another great recipe! Jess, I think you deserve 3 cookies!! Thanks so much for sharing this lovely review. I hope you love baking with coconut flour as much as I do! If I want to use butter in this recipe, do you know about how much I should use? Elizabeth, this recipe actually doesn’t need any butter at all! The peanut butter has all of the fat content that the recipe needs. If you add butter, the ratios will be off and it won’t come out as expected. If you give it a try, I hope you enjoy it! I try to eat as keto/low carb as possible but still like to have a treat now and then. These were fantastic!! I used the quest vanilla whey protein because it’s what I had on hand. I also used Lil’s chocolate chips so no extra sugar, yay! My ingredients gave me a net carb of 6 which is not bad for a cookie. Especially a cookie so delishious! The hardest part is not eating the whole batch? Thank you for the awesome recipe! Whooo hoooo! Thanks Blair! I am so glad these hit the spot! Hi Blair, what else did you modify to get 6 grams of carbs? I’ve literally never commented on a recipe before but I have to give you my praise. Excellent recipe. You can tell there’s protein in them but it isn’t bothersome at all, they taste great. I try to eat 1 gram of protein for every 10 calories and although this falls just short of that, the macro-ratio of these is really quite impressive. As someone who has made several similar attempts, this has got to be the most successful “healthyish sweet” project I’ve ever completed. I’ll be sure to visit again and check out your other protein-packed recipes! Will, I am SO HAPPY to hear this, thank you!! I used Wildtree vanilla vegan protein shake powered in these!! Turned out AWESOME!! I’m so glad to hear you loved them, Stacey! Hi Erin, I subbed out the coconut sugar for 1/4 cup Rice Malt Syrup and they worked out just fine. I also used natural crunchy peanut butter which has added a nice texture. Also, great tip about the 5-6 minute baking time, as I noticed they continue to harden up after you take them out of the oven. Thanks for the recipe. The protein powder certainly makes them a filling snack! Thanks for the notes, Rebekka! I’m happy to hear you enjoyed the cookies! Mine turned out very good but very dry; the store was out of coconut flour so I used wheat, might that be why? Otherwise any suggestions? Will definitely be making again! Hi Charlie, yes, substituting the flour could have made a big difference as coconut flour behaves completely different than wheat flour. If you do give the recipe another try, I’d love to hear how it goes! Could I sub erythritol for the sugar for a lower carb version? This recipe is so fantastic! Easily the best protein cookie recipe I’ve ever tried (and I’ve tried a lot). I used vegan vanilla protein powder (Purely Inspired brand) and I substituted the coconut sugar for Pyure sweetener. These will be my go-to treat now when I’m craving something sweet! And there’s nothing better (in my opinion) than peanut butter and chocolate together. The recipe made 18 cookies at 64 calories a piece. Yum!! Emily, thanks so much for sharing! I’m so glad to hear you enjoyed the cookies! I made these last night, and followed the recipe exactly, but was disappointed with the results. The peanut butter I used was natural/drippy, but I didn’t add any additional coconut flour, and they still turned out very dry. I only baked for 5 min. Also I found the vanilla whey protein powder overpowered the peanut butter flavor. My quest continues for a delicious moist protein cookie! Hi Erin, I’m sorry to hear you didn’t enjoy the cookies. The consistency of the peanut butter could have made a difference, as could have the brand of protein powder. It may still have needed a bit of additional milk as mentioned in the recipe notes or to come out of the oven a minute earlier. It’s hard to say what may have happened without being in the kitchen with you, but I know it’s disappointing to try a new recipe and not have it come out, so I truly wish you would have loved these! Random question… How do you calculate the nutrition facts? If you don’t mind sharing. Thank you, great recipe as usual. Hi Rayette, thank you! I use MyFitnessPal.com to calculate the estimate. I love this recipe – thanks so much for sharing it! I have made it many times and use plant protein powder (Plant Fusion Vanilla) and they turn out great. I do like to lower the fat content a bit when I am trying to reduce my fat intake so I substitute half of the peanut butter (1/4 cup) with 2 tablespoons of regular butter. It yields the same amount but does affect the consistency of the cookie a bit… but they are still delicious! Mike, thanks for sharing your tweaks! I’m so glad you enjoy the cookies. I used ancient tradition bone broth protein powder–banana creme. These are delicious!!!! Thank you!! Thanks for reporting back, TJ! I’m glad you enjoyed this! Do you bake then freeze? Or can you freeze the dough and bake a few at a time? Hi Noemi, yes, you can definitely freeze unbaked! You’ll want to keep a close eye on cooking time as it may take a minute or two extra from frozen. Hi, how many grams is half a cup, I have no idea what half a cup of peanut butter would weigh and I’m making these for my protein obsessed son tonight. Thanks in advance! Hooray! I’m glad to hear it’s a winner, Cynthia. Thanks for taking the time to leave this review! How can I make these to make a crunchy, less spongy cookie? Hi Zack, unfortunately, I think you may have to search for another recipe—these cookies are naturally soft and spongy since they don’t have butter. I’m glad you enjoyed the cookies, Tanya! Thanks for taking the time to leave this wonderful review! Gave these a go with a cinnamon whey protein powder and that really added an extra bit of spice. A quarter of a square of Lindt on top of half and a pecan on the other half! So delicious! Thanks for a beautiful recipe! YUM Alyssa! Thanks for trying the recipe and reporting back! Hi Paige! The green is most likely due to the sunflower seed butter. It has a reaction with the baking soda that causes the green color. It shouldn’t affect the taste, but if you want to avoid the green color in the future, you’ll need to use another nut butter. I hope you still are able to enjoy the cookies! Came out really crumbly. Not sure what I did wrong but tastes good. Hi Ivan, I’m sorry to hear you didn’t enjoy the cookies. The consistency of the peanut butter could have made a difference, as could have the brand of protein powder. It may still have needed a bit of additional milk as mentioned in the recipe notes or to come out of the oven a minute earlier. It’s hard to say what may have happened without being in the kitchen with you, but I know it’s disappointing to try a new recipe and not have it come out, so I truly wish you would have loved these! I’m having to go dairy and gluten free, I tried these cookies and they aren’t bad! I feel like the could be slightly sweeter but I’ve been eating them instead of breakfasts (I used to drink a slimfast but they have dairy) so it works! I replaced the mini chocolate chips with mini semi sweet chocolate chips. Danissa, thanks for sharing this review! I’m glad you enjoyed the cookies—I love the breakfast idea. Hi Lynard, the nutrition info is an estimate, and it’s calculated per 1 cookie out of 12 total. If specific numbers are important, I would recommend using a free online resource like MyFitnessPal using your exact brands of ingredients to get a more precise estimate. I hope that helps! The first time, I subbed garbanzo flour for coconut flour (despite the specific warning not to), whole egg for egg white, and Truvia baking blend (Stevia + white sugar) for the coconut/brown sugar, and I left them in the oven for about 7 minutes, until there was some visible browning on the sides. The result was a set of tasty but dry, rubbery blobs with the texture of a kitchen sponge. Yuck. The second time I used real coconut flour, separated the second egg, and added some molasses to the Truvia blend. I left the dough very wet and sticky, so I had to keep my fingertips wet with water to shape the cookies, and I took them out of the oven at exactly 5 minutes, even though they still looked underbaked (they weren’t). What a difference! When I followed the recipe, the result was FANTASTIC – soft, moist, delicious! 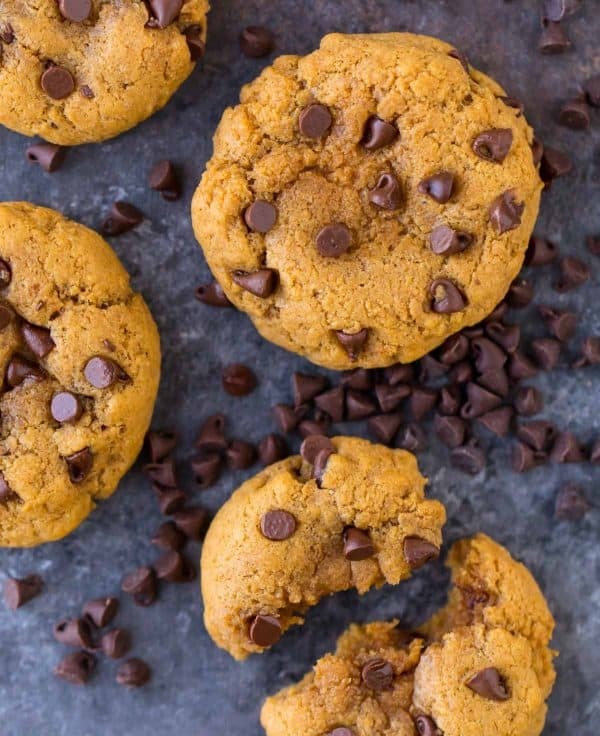 Protein powder cookies will never taste as good as flour-butter-sugar cookies, but this recipe comes pretty darn close! Thank you! Hi Jill, I’m glad to hear you enjoyed that second batch of cookies! Thanks for taking the time to report back and leave this review! I made these with pea protein. Texture and consistency is perfect, they do have a vague pea protein aftertaste. Thanks for reporting back, Carol! I’m glad you enjoyed the bars! These were an absolute hit! So hard to find protein powder based recipes! I found them a touch dry but I think that was my fault in not timing the oven to exactly 5 minutes (I left them a bit longer to brown on top). I made them with Carob nibs instead of chocolate chips for my boyfriend since he’s allergic to chocolate and he loved them! Glad you were able to come up with this recipe because like you said, all those protein brownies and cookies in the nutrition stores are like 500 calories! Silvia, I’m so glad you enjoyed these! Thanks for sharing your review! These are freaking DELISH! Thank you so much for the awesome recipe. I made it using Justin’s Classic Peanut Butter and a vanilla protein powder that I am not very fond of. Even with the protein powder, they came out sooooo good. YAY! So happy to hear this Shelly, thank you! Delicious and perfect! 6 min bake time as I have a lighter colored cookie sheet. Used “Whey Factors” brand Grass Fed French Vanilla powder and shelf stable PB called Smooth Operator by Peanut Butter & Co. No moisture issues. Made a solid dozen. Just hope I can make the last all week as I could eat them all in a day. Thanks for sharing this review, Jennifer! I’m glad they’re a hit! Just made these and they are great! I used chocolate protein powder and used shredded coconut in place of the chocolate chips. Fantastic! YAY I’m glad you enjoyed them, Jayne! Thank you for taking the time to share this review! What can you substitute for coconut sugar? My local stores don’t carry it. Thanks! Hi Janet! Check out the ingredient list—you can also use light brown sugar. I hope you enjoy! Thanks for taking the time to share your tweaks, Cynthia! I’m glad you enjoyed the cookies! Just made these! Followed the recipe and didn’t have any trouble with the dough being too wet or dry. Tastes like a regular cookie! Thanks! Mimi, thanks for taking the time to report back! I’m happy to hear you enjoyed the cookies! Awesome recipe! Sub. Coconut flour for almond flour. And the vanilla whey protein for vegan chocolate protein and it was perfect! Thank you! Thanks for reporting back, Holly! I’m glad you enjoyed the cookies! Thanks for the recipe. What if I don’t have coconut flour? What can I use as a replacement? I am baking these in the oven right now :) can i freeze some of the dough for later use and for how long? Hi Brenda! You can definitely freeze unbaked! Frozen baked cookies will last a few months, and I’m guessing unbaked will as well. You’ll want to keep a close eye on cooking time when baking from frozen, as it may take a minute or two extra. They’re great! Everybody loves them! We have been using brown sugar and peanut butter plant-based protein (Orgain). I really hated the protein on its own, but now that we’ve been making these, I almost want to buy more! I found this recipe because I was looking for a way to use the protein and I found a new favorite recipe. Thanks! Ashley, I’m glad the cookies are a new favorite! Thanks for taking the time to share this review! These are so yummy! When I calculatedly mine I got 139 calories per cookie (obviously due to different protein powders and peanut butters) but I’m pretty stoked with that amount compared to a lot of protein cookies you buy at the store. Mine didn’t look too much like the picture and ended up a bit cakey but I probably didn’t squish them down enough. Not a problem but I will squash them more next time as they pretty much don’t spread out at all like a normal cookie does. Thanks for taking the time to share this review, Amy! I’m glad you enjoyed them! These are delicious! I used half regular and half vegetable (trying to use it up because I don’t like it) vanilla whey. WHOOO HOOO Leacy. So glad you loved them! These look so good! Do you use this base in any other recipes? Thanks for sharing! What brand of protein powder do you recommend? Vanessa, you can use any kind you like! Vanilla is my favorite for this. Bob’s Red Mill makes a great pea protein based one. For whey, I often use Optimum Nutrition. Thanks for sharing your notes, Emily! I’m glad they were a hit! Just made this recipe and cookies are fresh out of the oven. They taste great and help with my sweet tooth! I used Orgain peanut butter protein powder with definite success! Thank you for sharing your recipe! Mo, I am SO happy to hear it, thank you for sharing this wonderful review! I used powdered PB instead of protein powder, runny style natural PB, and added about 1/4 cup rolled oats to counteract the runny pb. Still only cooked for 5 minutes and they are chewy and yummy. I’m storing in fridge for my own quirky preference for cold baked goods. Thanks for sharing all your tweaks, Jenny! I’m glad you enjoyed them! Hi Sammy, I haven’t tried using anything besides eggs. You could try two flax eggs, but it’d be an experiment. Coconut flour needs a lot of moisture, which is why I use eggs here. If you give it a try, I’d love to hear how it goes. I have made these a few times now with vanilla pea protein, and powdered peanut butter. They are ‘cakey’ in texture, but still work well. Even done them as hot cookie dough as a dessert. James, thanks for sharing this review! I’m glad the recipe is a hit! Faye, I am so pleased to hear how much you enjoyed this recipe, thank you for sharing! !